The Wheels on the Bus is great hand motion song for the beginning of the school year. Preschoolers love the repetitive verse and fun hand motions. 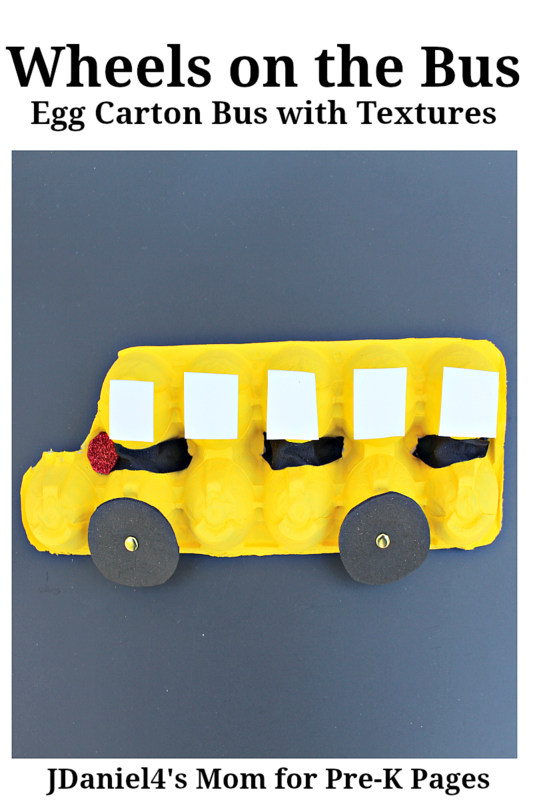 Here is a fun egg carton school bus to go along with the classic song. The bus features easy-to-find materials and is interactive just like the song The Wheels on the Bus. 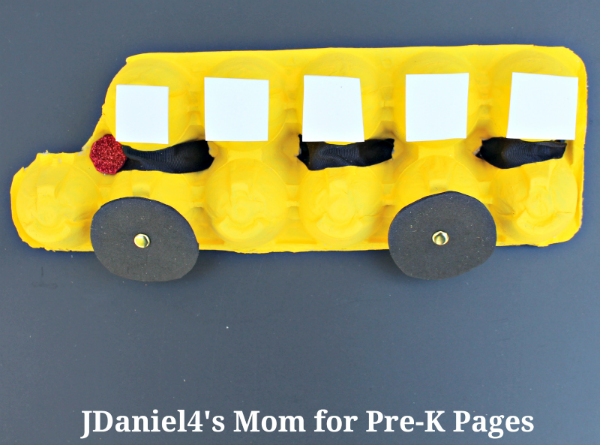 Before your children put this bus together, you will need to cut out the first egg section in the top row. Make slits in each of the indented areas between the two rows of egg sections (to weave the ribbon). 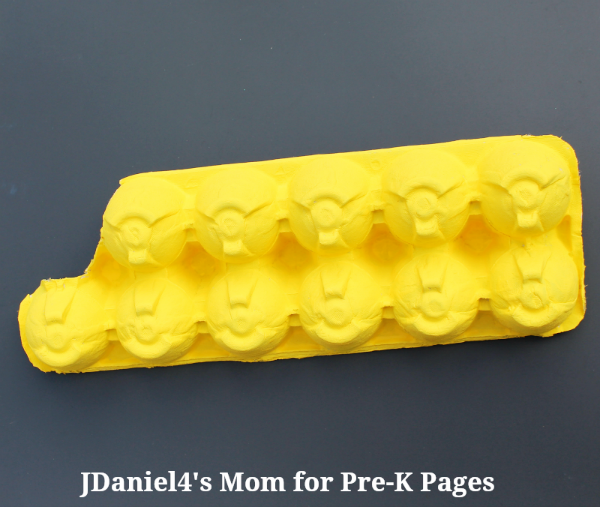 Invite the preschoolers to paint the egg carton with yellow paint. You may need to do this step on one day and add the details on another day so the paint will be completely dry. When the paint is dry, help your preschoolers attach wheels to the bus with brass fasteners. If you think it will be too difficult for your children to push the brads into the egg carton, cut slits in the cardboard ahead of time. Next, show your preschoolers how to weave the ribbon through the slits you created between the rows. They can start by pushing the ribbon up through the first slit. They will end by pulling the ribbon through the last slit. Knot both ends of the ribbon (and perhaps tape them) so the ribbon will stay in place. 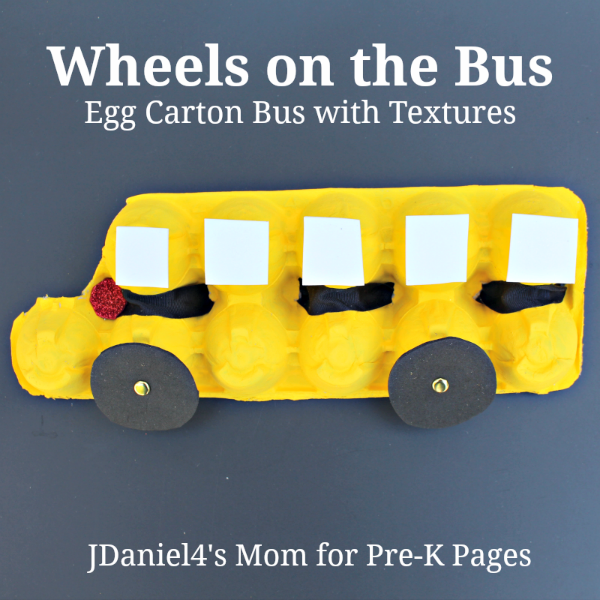 Tell preschoolers to place a dot of glue on the top of each egg section in the top row. They can add a window (square of white foam) onto each glue dot. Windows could be made from white card stock, too. Finally, your preschoolers will attach the red glittery octagon near the front of the bus. Yes, it is small. I didn’t want it to get the way of the wheels. You could make your signs larger if you choose. 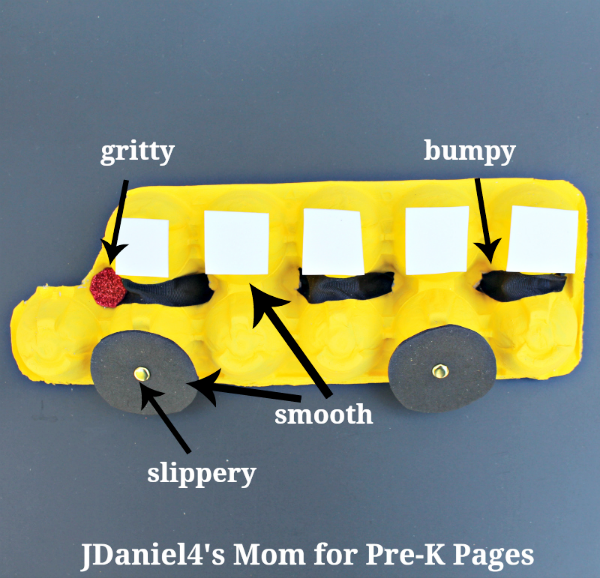 While it is fun to make a cute bus with your preschoolers, this activity was designed to explore a variety of textures and work on fine motor skills. You can ask your preschoolers to describe how the elements below feel to them. The stop sign octagon is made of a gritty sparkly paper. It may feel rough on your preschooler’s fingers. The wheels and the windows are smooth. They may feel soft on your preschooler’s fingers. The fasteners on the wheels are slippery. They may also feel cool to your preschooler’s fingers. The grosgrain ribbon has ridges in it. They may feel bumpy to your preschooler’s fingers. The weaving of the ribbon and the placing of the brass fasteners are both fine motor skills. Some of your preschoolers may need help with them. To add more interactivity (and more fine motor practice), stick Velcro dots on the top row of egg sections and place the other half of the Velcro on the windows. Children can put the windows on and off of the bus. Or use small pictures of your children with Velcro on the back to attach to the bus. You could even make small cards with letters and sing about the letters on the bus. You could use this bus in other centers in your classroom or in other ways as you begin the school year. Follow my Back to School Board on Pinterest for more great ideas! Next Post: Activities for Brown Bear, Brown Bear, What Do You See?